The court granted plaintiff's motion to exclude the testimony of defendant's damages expert regarding a running royalty rate as unreliable because it relied on non-comparable license agreements. "Defendant argues that [its expert] is not using these licenses to estimate a reasonable royalty, but instead only to set an appropriate upper limit to Plaintiffs damages claims. Defendant's theory is that the Company A and B licenses -- because they concern large, worldwide portfolios of standard-essential patents -- are economically comparable to the [patent-in-suit] in the sense that their value compared to a single asserted patent is much greater. . . . [Defendant's expert] provides no opinion that even attempts to describe the value of the patented technology in any specificity, in order to compare the value of the [patent-in-suit] to these large patent portfolios. He simply makes the bare assertion that these standard-essential, FRAND portfolios should intuitively be worth far more than a single asserted patent. . . . [His] failure to even attempt to reference the economic value of the patented technology in any specificity, or that of the standard-essential FRAND licenses he compares it to, renders his damages opinion fatally insufficient." The court denied defendants' motion for summary judgment to limit plaintiffs' damages for their failure to mark their orthotic devices. "Plaintiffs concede that they do not print the patent marking on the patented product itself; rather, they print the marking on the outside of the product’s packaging. . . . [T]he bright line physical-possibility test advocated by Defendants and a handful of district court opinions is not the correct standard. To the contrary, the Federal Circuit has made clear that courts must apply a much more flexible test that asks whether the method of marking effectuates the statutory purpose of § 287, namely, placing the public on notice that the product is the subject of a patent. . . . [T]he question before the Court is not whether it is physically feasible to include a patent marking on [plaintiffs'] product. . . . Plaintiffs’ evidence is sufficient for a reasonable jury to conclude that 'the public may be better notified with marking on the packaging, as opposed to [on] the article itself.'" The court granted defendant's motion to dismiss because the asserted claims of plaintiff’s patents for testing enzymes to assess cardiovascular disease encompassed unpatentable subject matter and found that the claims lacked an inventive concept. "Plaintiff argues that the prosecution history shows that the patents-in-suit claim a nonroutine way of measuring and using [an enzyme] to achieve a new and useful result. According to plaintiff, it invented a specific way to 'see' [the enzyme]. . . . [E]ven though plaintiff may have been the first to 'see' [the enzyme] by looking at the amount of [the enzyme] molecules and/or the enzymatic activity level, these values are naturally occurring and their discovery does not render the patents eligible under § 101." The court "reluctantly" granted defendant's motion for a new trial after a jury verdict of validity and infringement because of plaintiff's improper arguments regarding copying and the burden of proof. "[D]uring a lengthy sidebar, the parties agreed to take the issue of copying out of the case. . . . In closing, [plaintiff's] counsel reminded the jury that [plaintiff's former employee/defendant's executive] saw [plaintiff's] Infinity System press release and sent it around at [defendant]; [defendant] acquired an Infinity communicating system and tore it down; and [plaintiff's former employee] took documents from [plaintiff]. Rather than relate this evidence to willful blindness, as forecast above, [plaintiff's] counsel instead related it to infringement. . . . [Plaintiff's] counsel also stated during closing that the clear and convincing standard for invalidity is the 'exact same standard in this State [used] ... to terminate someone's parental rights, meaning that that level of proof is required to take away someone's kid.'. . . The question presented is whether, in [plaintiff's] closing argument, counsel simply approached the line drawn by the court (on the issue of copying) or by the traditional protocol practiced in this court (in describing the burden of proof), or crossed it? Despite the curative instruction, the trial record was complex enough and, more significantly, balanced enough to make any gratuitous argument sufficient to tip the balance for the wrong reason." In a final written decision, the Board found claims of a patent directed to the production of an insurance claim valuation report unpatentable under 35 U.S.C. § 101. "Here, we observe that each challenged claim is directed to the fundamental concept of providing a vehicle valuation using information about the vehicle. Patent Owner contends that, unlike the claims in [Parker v. Flook, 437 U.S. 584 (1978)], the claims at issue in the instant proceeding are not drawn to an algorithm. When the claims are analyzed as a whole, as urged by Patent Owner, however, the claims recite nothing more than the collection of information to generate a valuation report for a damaged vehicle. Moreover, all the steps could be performed without the use of a computer. . . .The fact that the claims at issue are not per se drawn to an algorithm does not insulate them from being found an abstract idea." Following remand, the court again denied defendant's motion for attorney fees under 35 U.S.C. § 285 because plaintiff's litigation tactics were not exceptional. "[Defendant] emphasizes that [plaintiff] filed 70 infringement actions across the country against customers who use the accused live chat technology on their websites-rather than the suppliers making and selling the technology in a ploy to get the suppliers to intervene and pay for settlement licenses. [Defendant] further asserts that [plaintiff's] lack of diligence in discovery and deficient infringement contentions demonstrate a lack of intent to ever pursue this case on the merits. . . . While [defendant] criticizes [plaintiff] for bringing suit against customers who use the live chat technology, rather than the suppliers who make and sell the technology, I cannot find this case exceptional simply because Plaintiff did something that is expressly allowed and contemplated by the Patent Act." The court granted defendant's motion for summary judgment that plaintiff's distributed learning patent was invalid for lack of patentable subject matter and found that the claims were directed toward an abstract idea. "Plaintiff responds that the [patent-in-suit] is 'not directed to the abstract idea of a classroom,' but instead claims 'specific methods and systems of distributed learning — an instructional model that allows instructors, students, and content to exist in different physical locations so that instruction and learning can occur independent of place and time.'. . . [T]he claims are directed to the abstract concept of creating a virtual, interactive learning environment. . . . Plaintiff's argument that the idea of 'real time, interactive distance learning' claimed in the [patent] 'necessarily requires a technology solution' is similarly beside the point, for the fact that a method can only be performed using a computer does not necessarily render Section 101 inapplicable." Being involved in a lot of patent cases isn’t always the best indicator of a firm’s patent litigation experience. 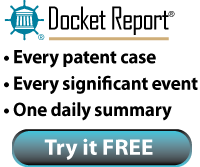 At Docket Navigator, we look at patent litigation data from many different angles. Another way to measure a firm’s experience is to analyze the number of completed milestones that occurred in the firm’s cases. In this way, hard-fought cases are given more weight than cases that settle at an early stage. In 2015, the top firms in district court cases, based on the number of completed milestones, are listed below. For more information about case milestones, see pages 14-17 & 55 of the 2015 Year in Review Report. Click here to download your copy of the report today! The magistrate judge recommended denying without prejudice defendants' motion to dismiss for lack of patentable subject matter and rejected the argument that plaintiff's network communication patent was directed toward an abstract idea because the claimed steps could be implemented in a "brick and mortar" scenario. "Defendants placed significant stock in their assertion that the claim's steps can be easily implemented in a 'non-computerized 'brick and mortar'' context: that of a customer's placement of a telephonic order with a merchant. . . . [A] telephone conversation between two individuals is not a 'stateless protocol'. . . . [T]he very core of the problem that claim 1 is attempting to address -- how to retain state in computer-based communications that would not otherwise be able do so -- is not necessarily even a problem at all in Defendants' proposed brick and mortar scenario. . . . [I] would be hard to describe Defendants' scenario as involving the application of a 'well-known and widely applied business practice' to the computer realm. It is obviously possible, of course, for a merchant to repeat back all of the information a customer has previously shared with him, each time the customer seeks to order an additional item from the merchant. But it is hard to argue that this is the way that humans typically communicate in the real world." In a final written decision, the Board found claims of a patent directed to a method and system of making loans unpatentable under 35 U.S.C. § 101. "[Petitioner] has established, by a preponderance of evidence, that each of the challenged claims is directed to a fundamental economic or longstanding commercial practice of loan processing. . . . Whereas conventional loan processing required human beings to collect, compare, evaluate, and disseminate loan applications and loan information by hand, claims 1 and 19 recite the use of a database and transaction server to maintain loan applications so parties can search and modify the loan applications using those computer components instead of using pen and paper to perform these processes. . . . The Federal Circuit recently held that the use of generic computer functions to automate a price optimization process was a fundamental economic practice and abstract idea. . . . The challenged claims of the ’947 patent recite methods and systems for processing loan applications that fall squarely within the realm of an abstract idea." 2015 Year in Review Report Now Available! The court denied defendant's motion to exclude the testimony of plaintiff's damages expert regarding lost profits as unreliable. "Instead of identifying a single but-for market in which to allocate lost sales, [the expert] opines that [plaintiff] would have made a share of [defendant's] sales in either of two market segments. . . . [Plaintiff's expert] expresses no opinion as to which of the two market segments more accurately models consumer behavior. . . . [Defendant] argues that [the expert's] lost profits analysis is unreliable because it fails to define a single relevant but-for market and that it is improper for [the expert] to thus leave the ultimate question of the appropriate market segment to use for calculation of lost profits damages to the trier of fact. . . . [Defendant] does not take issue with the methodology underlying each of [the expert's] two market reconstructions and there is no reason not to consider each of the reconstructions, on its own, sufficiently reliable to be helpful to the trier of fact. . . . [T]hat [the expert] leaves to the factfinder the determination of predicate facts underlying an ultimate determination of the appropriate lost profits within the reliably established range is not a ground to exclude his opinions." The court denied plaintiff's motion to strike the updated report of defendant's damages expert regarding his opinion that five defendant phones not subject to the upcoming retrial were noninfringing alternatives. "[The five phones at issue] were all accused of infringing the [one] patent at the [original] trial. At the [original] trial, the jury found that all five phones did not infringe [that] patent but did infringe other [plaintiff] patents. . . . The Federal Circuit did not hold, as [plaintiff] urges the Court to do in the instant case, that products covered by patents other than the one for which damages are sought cannot, as a matter of law, be evidence of available non-infringing alternatives. . . . Because an acceptable non-infringing alternative need not be a product that was actually on the market at the time of infringement, the fact that the [defendant's] products infringed some of [plaintiff's] patents does not preclude [defendant] from arguing that the non-infringing aspects of these products provide evidence that [defendant] could have offered a fully non-infringing product that would have been an acceptable non-infringing alternative." Following the patent owner's disclaimer of certain challenged claims, the Board denied institution of covered business method review of a patent directed to electronic commerce because the petitioner did not show that the patent was a covered business method patent under § 18(d)(1) of the AIA. "Petitioner challenges claims 1–20 of the ’177 patent, of which claims 1–10 have been disclaimed. . . . [F]or the purposes of whether or not to institute a covered business method patent review, we treat claims 1–10 as never having existed. . . . We acknowledge that other panels of the Board have taken the caveat that an otherwise statutorily disclaimed dependent claim, which includes finance-related subject matter, may still be considered, to the extent that the still pending independent claim from which it depends may include claim limitations that encompass the finance-related subject matter of that dependent claim. . . . Petitioner has identified little relevant overlap between claims 1–10 and claims 11–20, in that the more overt finance-related subject matter of claims 1–10 identified by Petitioner – 'selection client' of claims 2 and 6, and 'retrieval client' of claim 7 – are not recited in claims 11–20. Accordingly, we determine that in this proceeding, a proper analysis as to whether the ’177 patent is a covered business method patent should focus exclusively on claims 11–20." The court denied defendants' motion to disqualify one of plaintiff's attorneys who previously acted as in-house counsel for a company related to plaintiff on the basis that defendants intended to call the attorney as a witness. "Defendants argues that [the attorney] should be disqualified because they intend to call him as a witness on a variety of topics. . . . Defendants have failed to demonstrate that any testimony by [the attorney] would be sufficiently adverse to [plaintiff]. Accordingly, as Plaintiff does not intend to call [him] to testify on its behalf and as Defendants have not met their burden of showing that [his] testimony would be adverse to Plaintiff, the Court will not disqualify [the attorney] on the basis of [the Florida Advocate Witness Rule]." The magistrate judge recommended granting in part defendants' motion to dismiss because certain asserted claims of plaintiff’s cloud computing patent encompassed unpatentable subject matter and found that the claims were directed toward an abstract idea. "The Court concludes that 'setting up and managing a cloud computing environment' does, in fact, amount to an abstract idea. The concept implicates an idea 'having no particular concrete or tangible form' and that is 'devoid of a concrete or tangible application.'. . . Plaintiff's position here seems to be that '[m]anagement of cloud computing environments [have] only recently emerged as a technological innovation[,]' and are not as 'longstanding' a commercial practice as other forms of computing system or resource management. But nowhere have courts concluded that a patent claim cannot be directed to an abstract idea if the claim relates to a field that is of somewhat recent vintage." The magistrate judge recommended denying defendant's motion for summary judgment that plaintiff's website digital labelling patents were invalid for lack of patentable subject matter and found that the claims were not directed toward an abstract idea. "'Gathering' data may describe an abstract idea, but 'producing' a 'label' based on that data does not describe an abstract idea. . . . Processing gathered data to 'produce' 'something symbolic' does not describe an abstract idea because that process is a specific and concrete implementation of data storage. . . . The 'responding' limitation may describe the somewhat abstract idea of reacting to information from a source. The 'guiding' limitation, however, describes a more specific and concrete way of processing information." The court granted defendant's motion to compel communications between an NPE plaintiff and its counsel that plaintiff disclosed to the named inventors before plaintiff acquired the exclusive option to purchase the patent-in-suit and rejected plaintiff's work product argument. "Before [plaintiff] acquired an exclusive option to purchase the patent, it lacked a common legal interest with the named inventors. At that point, [plaintiff's] interest was in pitching the value of a business partnership to the named inventors and possibly in highlighting concerns about invalidity and title in order to drive down the price. Any discussion of litigation at that stage remained hypothetical and incidental to the arms length evaluation of the prospect of a business relationship. . . . The presence of a non-disclosure agreement covering these disclosures weighs in favor of finding a common legal interest, but it is not conclusive. [Plaintiff] may not extend the scope of work-product immunity by asserting that a common legal interest existed according to a contract where one does not otherwise exist under the law." The court denied the parties' motion to vacate the court's earlier order granting defendant's motion for judgment on the pleadings that plaintiff's data processing patent was invalid because the parties had settled. "[T]he parties do not address any element of Rule 60(b). Rather, they simply indicate that vacatur is proper because it would 'serve the public interest since it facilitates a resolution of all the litigation between the parties and the dispute regarding this particular issue.' In other words, the public interest is served by the settlement of this action. This is insufficient. . . . The parties do not point to any 'extraordinary circumstance' that would warrant vacatur." The court overruled defendants' objection to the magistrate judge's ruling allowing evidence of copying and rejected their argument that the magistrate judge failed to consider the magnitude of the nexus between the alleged copying and the patented features. "The Magistrate Judge correctly held that 'secondary considerations of non-obviousness serve as an important check on hindsight bias and ‘must always when present be considered.’'. . . [T]he Magistrate Judge correctly admitted evidence of copying for which [plaintiff] had shown a prima facie nexus, e.g., via an expert opinion that the copied product practices one or more asserted claims." The court rejected defendant's argument that "'[t]o be relevant, the alleged copying must be of the patented feature of that product and not, for example, some unpatented feature.' The magnitude of the nexus between the alleged copying and the patented features determines whether evidence of copying should be 'given significant weight.'" The court deferred ruling on defendant's motion to exclude the testimony of plaintiff's damages expert regarding a reasonable royalty for unreliable apportionment and ordered plaintiff to produce a supplemental report curing the expert's deficiencies. "[Plaintiff's damages expert] considered [an industry expert's] opinion on the desirability of [plaintiff's] patented features and reduced [defendant's] total revenue by 50% to account for a 'conservative calculation' of the 'but-for' revenue allegedly 'enabled' by [plaintiff's] patents. Then, [he] subtracted out those revenues he believed were subject to lost profits from the 50% 'but-for' revenue to determine the incremental revenue that comprises the royalty base. . . . Though [plaintiff] argues that the original 50% reduction was sufficient to 'isolate or apportion the incremental revenue associated with use of the patents in suit,' the Court finds that such reduction is insufficient. . . . [The expert] fails to properly apportion out the value of the unpatented features of [the] accused products in determining his reasonable royalty opinion. Consequently, [his] current opinion fails to provide an ultimate combination of royalty base and royalty rate based on the 'incremental value that the patented invention adds to the end product.'" The court denied defendant's renewed motion for judgment as a matter of law that the jury's damages finding was insufficient and rejected defendant's argument that the jury reached a quick compromise award of $15.7 million. "[Defendant] alleges that the jury simply 'split the difference' between [the parties'] competing damages calculations to arrive at an 'arbitrary' award. [Defendant] alleges that [plaintiff's damages expert] provided the jury with no evidence or guidance in selecting an amount within his proposed damages range and that the speed with which the jury returned its verdict [about an hour] implies that the jury rendered a quick compromise decision. . . . The jury ultimately awarded . . . a number near the low end of [plaintiff's] request. . . . [T]he Court concludes that the jury reached a reasoned and supportable decision and declines to disturb the jury’s judgment." The court granted defendant's motion to dismiss because the asserted claims of plaintiff’s interactive television application patent encompassed unpatentable subject matter and found that the claims were directed toward an abstract idea. "The practice of controlling access to information by verifying credentials (via well-known encryption methods) is neither novel nor specific to interactive television systems. . . . [The patent-in-suit] merely applies this practice to a specific technological environment (i.e. internet based interactive television applications) with the use of a general purpose computer, which performs credential verification. . . . [T]he [patent] claims are directed to the abstract idea of controlling access rights of software applications to access other software applications in the technological environment of interactive television systems."